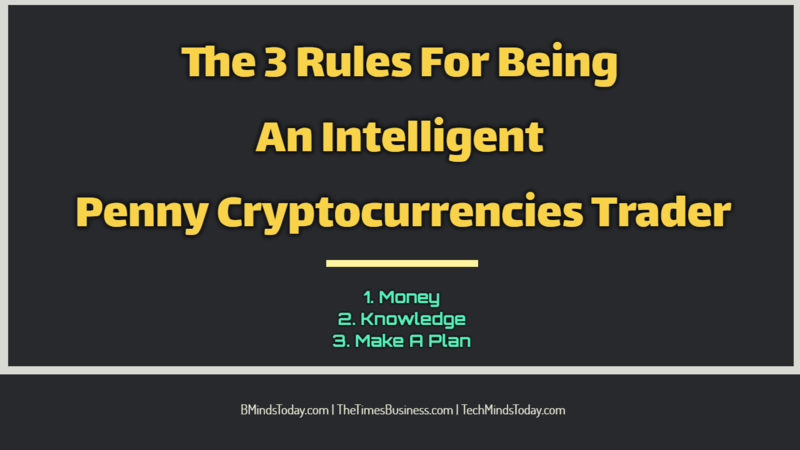 If you want be a successful penny cryptocurrencies trader, you’ll need to be an intelligent trader. There are very few requirements to start trading in penny cryptocurrencies. It can be broken down into three main things. The money we are talking about is not just the money that is sitting in your bank account. It is not the money that you use to pay for your rent, your car or your food. Penny cryptocurrencies can be extremely unpredictable and although you might make a great deal of money it is also true that may lose everything, so it is important especially when you are starting out with penny cryptocurrencies that you only use money that you can afford to lose. After you have built up a nice profit, you can re-invest your profits from past trades which will snowball your earnings. This is without a doubt the single most important factor in determining whether your budding career as a penny cryptocurrencies investor will be a spectacular triumph or a dismal failure. If you are a newcomer to investing of any kind there are various guides you can buy and it is a good idea to read several books and articles before spending any money. Books and articles are good and although they will not help you with specific decisions such as whether to buy a particular coin or token, or when to sell, they give you a good background on how it all works and are invaluable in building a good knowledge base. Before you investing any money, make an investment plan and stick to it at all times. This will help you become disciplined and will also help you organise your time and investments. Keeping things simple will result in less stress. Your plan should consist of the investments you are going to make and why and how much you are investing in them. It should also include your exit point (the price which you will sell your investment at to take profit) and also the time you want to allocate for your investments each day (i.e. the time it takes to monitor and research them). Now you have got all the key essentials in place you are set for the roller coaster ride that is the world of investing in penny cryptocurrencies. But remember that knowledge is the most influential tool to accomplish your financial goals.